Unlike Windows 10 apps from the Microsoft Store, desktop programs are installed and uninstalled directly through the desktop itself. To see which desktop programs are installed, open the Control Panel. Type control panel in the Search box (it’s located on the left side of the taskbar) and select Control Panel in the Search panel. The Control Panel presents many functions for tweaking your computer setup. A fast way to access Control Panel is to right-click the Start button and choose Control Panel on the pop-up menu. In the Control Panel window, under Programs, select Uninstall a Program. (You don’t have to uninstall anything; you can simply see what the option offers.) You see the Programs window. 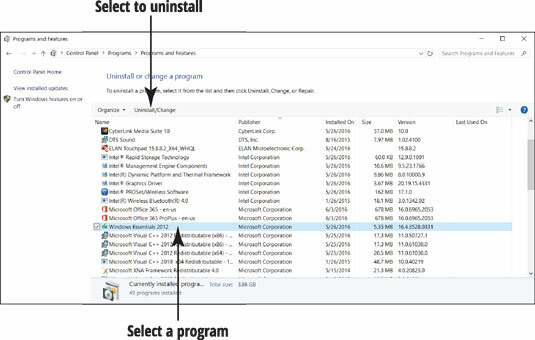 Select the Uninstall a Program link to open the Programs and Features window. 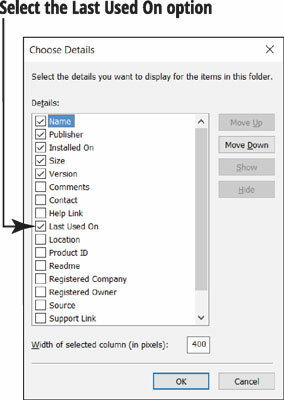 Mouse: Move the mouse pointer over any column heading, such as Name. Click the right mouse button. Touchscreen: Tap and hold down on any column heading, such as Name. When a box appears around your fingertip, lift your finger. On the context menu that appears, select More. In the Choose Details window, select Last Used On and then select the OK button. The Last Used On column appears to the right of all the other columns. To change a program, select it. For this example, select Windows Essentials, as shown. Select the Uninstall/Change button (it’s located above the list of program names). The Windows Essentials screen offers options to Remove One or More or to Repair All. Some programs offer the Change option to change the program as well. Repair or Change may be useful for a desktop program that you want to keep but isn’t running as expected. If you uninstalled Photo Gallery or another program, it will no longer appear in the Programs and Features window or on the Start screen. Just because you can uninstall a program doesn’t mean you should. You can simply ignore programs you don’t use. Look at a program’s name, publisher, and date installed to determine whether you actually use a program. 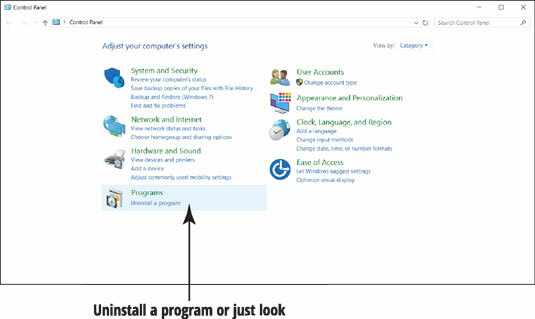 You may recognize a program you installed recently, as opposed to one installed before you got your computer. If you find that it’s more productive to remove large programs than small ones, repeat Steps 3 and 4 to group by size. Before you uninstall a program that you may want to reinstall later, make sure that you have a copy of it on a CD or DVD (or that you know where to download it from the Web again). You have no undo option when you uninstall a program.